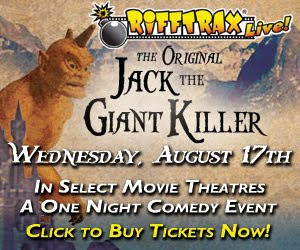 A couple of years ago now, I saw one of RiffTrax's one-night-only LIVE! in-theaters events and had a blast. I assumed the RiffTrax crew (former MST3K alumni Mike Nelson, Bill Corbitt, and Kevin Murphy) would only be able to continue doing public domain titles like they have so far (HOUSE ON HAUNTED HILL, PLAN 9, REEFER MADNESS) for all similar future LIVE! in-theater events, but here they have a total golden-age matinee fantasy adventure classic up next! I absolutely love the monster-filled, visually fantastic, storybook-colored, kooky and spooky George Pal/Harryhausen-esq JACK THE GIANT KILLER (1962), so I'm really looking forward to this one. Feel you there! JACK THE GIANT KILLER (2012) is actually being remade at the moment by a PUBLIC ACCESS/USUAL SUSPECTS re-team-up of writer Christopher McQuarrie (PUBLIC ACCESS, THE USUAL SUSPECTS, THE WAY OF THE GUN, THE TOURIST, MI:4) and director Bryan Singer (PUBLIC ACCESS, THE USUAL SUSPECTS, APT PUPIL, X-MEN, SUPERMAN RETURNS, VALKYRIE). No doubt, the new version will be more of a modernized medieval blood-and-mud dark-paletted contemporary CGI-fest rather than an old-school optical effects laiden rainbow-colored kiddie matinee fantasy fever dream, but maybe it will still be fun in its own way.